Chelsea boss Maurizio Sarri has a double injury concern with doubts over Pedro and Antonio Rudiger being available in midweek to face Liverpool in the League Cup. 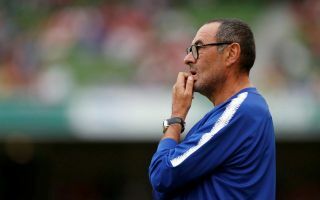 The Blues face their rivals twice in a matter of days as they meet in the Premier League at the weekend too, and so the Italian tactician will undoubtedly be desperate to be at full strength for the clashes. However, it appears as though he may well be missing two key individuals on Wednesday night at least, as noted in the tweets below from freelance injury analyst Ben Dinnery. It’s noted that Sarri revealed he hopes to have Pedro back by the end of the week, which seemingly rules him out of the Cup game and perhaps gives him a chance of recovering in time for Saturday’s encounter. Given the Spaniard’s importance so far this season which has seen him score three goals in just five Premier League games, Chelsea will want him back as soon as possible but without putting him at risk of suffering a setback. Meanwhile, while the influential winger missed out against West Ham United entirely, Rudiger hobbled off during the game with a hamstring problem. However, Sarri has allayed fears to an extent by suggesting that it should be a matter of days before the issue clears up, thus suggesting that Rudiger could also be in line to return on Saturday but will be absent in midweek. Securing a return to the Champions League will be a priority and so the league clash will undoubtedly take on more importance. Nevertheless, the former Napoli boss will surely also be eager to win silverware in his first season in charge, but time will tell if he takes it seriously or opts to rest more key players aside from his injured duo.